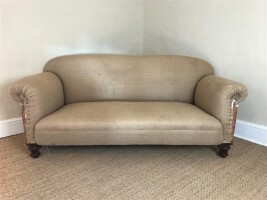 A large William IV country house sofa circa 1835 with outswept arm supports on turned mahogany legs and Cope patent casters. 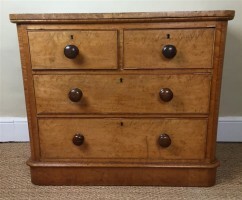 A Victorian birds eye maple small chest of drawers circa 1870 with 2 short and 2 long drawers on plinth base. 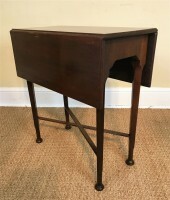 A George 111 mahogany drop flap table circa 1770 on turned legs united by a cross stretcher. 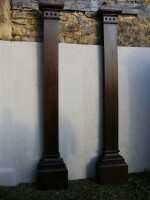 An unusual pair of William IV oak architectural columns c1835. 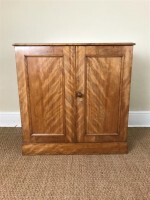 A small Victorian satin birch side cabinet circa 1870 with a pair of cupboard doors. A Regency painted pine box Lincolnshire circa 1820 with original painted decoration and unusual applied pamphlets on the inside of the lid commemorating the death of Methodists Thomas and Anne Swaby in 1824. A George 111 pine dresser base circa 1800 in lovely original condition with original patination on the timber and brass swan neck handles to the drawers on square legs. 78 inches wide 21 inches deep 31 inches high. A Large mid 19th century Corinthian column lamp circa 1860. A Large mid 19th century Corinthian column lamp circa 1860. This lamp can be re wired with "antique " bronze double flex for £30. Read more: A Large mid 19th century Corinthian column lamp circa 1860. 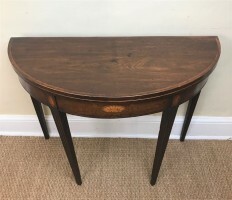 A George 111 mahogany half round card table circa 1790 cross banded and boxwood strung with original satinwood conch inlay to the frieze and shell paterae to the tops of the square tapering legs. The interior lined in green baize . A large Arts and Crafts pine kitchen table circa 1910 with bleached and faded top on square chunky fluted legs. 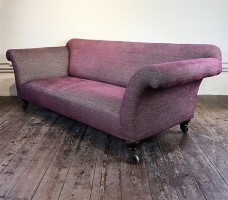 A great kitchen table to seat 8 comfortably with plenty of leg room at nearly 25 ins to the frieze. 62 inches wide 37 inches deep 32 inches high. 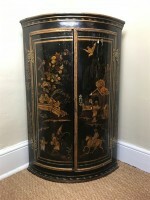 An early 18th century Chinoiserie lacquered corner cupboard circa 1730 in lovely original condition. 23 inches wide 15 inches deep 36 inches high. 16 inches wide 14 inches deep 32.5 inches high. A George IV painted console table circa 1830 in the Grecian style in lovely condition with lappet carved frieze and the original white marble top on bold carved scrolled legs. A George 111 oak elm and fruitwood tripod table circa 1800 in lovely original condition. 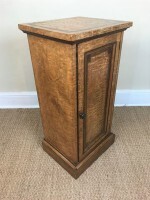 Read more: A George 111 oak elm and fruitwood tripod table circa 1800 in lovely original condition. A late Georgian pine cricket table West Country circa 1830 in totally original condition . A Georgian West Country pine and ash cricket table circa 1800 in lovely original condition with a soft honeyed patina . A fine quality Victorian birds eye maple dressing chest attributed to Holland and Sons c 1870. 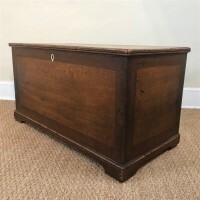 Read more: A fine quality Victorian birds eye maple dressing chest attributed to Holland and Sons c 1870. A Victorian oak partners desk c 1880 with drawers to one side and cupboards simulating dummy drawers to the other. A late Georgian white painted standing cupboard circa 1830 in completely original condition. 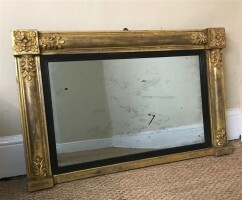 A small George gilt over mantle mirror circa 1830 with original distressed mercury plate. 34 inches wide 22 inches high. 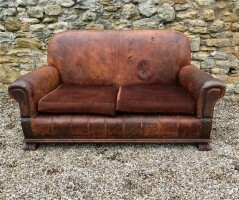 A late Victorian walnut sofa circa 1890 prepared for recovering in hessian on four turned walnut legs. A late Regency oak boot rack circa 1830.